How can I protect my fingers while using a band saw? I intend on using a band saw to cut out large meeples (the wooden pieces from the board game Carcassonne) from a 2x4 board. I'm worried about cutting my fingers. What tool can I use to help keep my fingers out of harm's way? I've noticed push sticks, but the only ones I can find are push sticks that help you re-saw boards with a band saw. Is there a similar tool to help protect your fingers as you guide the board to cut out shapes? Create a jig to hold the pieces in position for the various cuts. The jig will allow to maintain a safe distance from the blade and if designed well will give you a secure grip on the piece being cut. Also try to design your cuts for mass production. For example cut the gap between the legs and around the heads while all the pieces are still one long piece of wood. Then cut the gaps under the arms and free each piece from the strip at the same time. You may want to consider leaving 4-6 inches of uncut wood at each end of the strip to give you something to hold on to while cutting the last piece on the strip. When freeing pieces from the strip start in the middle and work each half of the strip to your 4-6" handle. 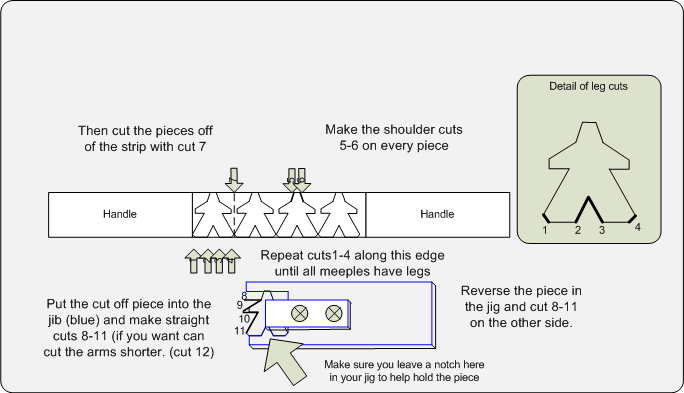 I've included an image of the cuts I would plan, and a simple diagram of a jig to hold the piece while cutting. Do not wear gloves while using a bandsaw (or any powered saw, drill press, or planer for that matter). The gloves will give you a false sense of security and do very little to protect your hands. In fact, they may end up getting your fingers pulled into the blade if the material catches. Which would you prefer: a cut fingertip, or a mangled hand? The best way to protect your hands is to be very deliberate about every movement you make around the saw, and keep your hands away from the blade by using a push stick or push block. 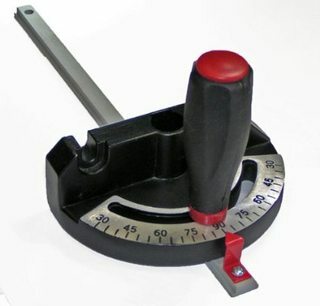 If the cuts you are making are simple straight lines, get a miter gauge that slides along the miter slot that is present in most band saw tables. 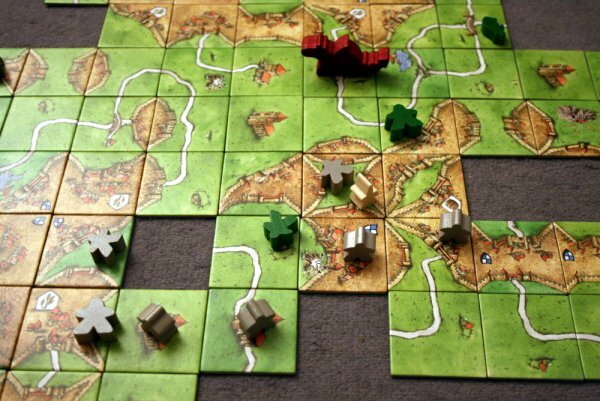 After a clarification from @ArgentoSapiens, I realized you're looking to cut the smaller person-shaped game pieces and not the board tiles. The way those are most likely cut in the factory would be with a router table and specialized router bits. Stock would be fed through to create one very long "extruded" meeple which could then be cross cut into many smaller pieces that are only 1" or so thick. You could probably do this with just a few router bits if you've already got a router and a table. This would be a much faster and safer way of doing it. If you don't have a router and router table, then I suggest using a band saw or scroll saw as you planned. However, don't cut the stock into roughly "meeple" sized pieces first. Plan on wasting a lot of wood for safety's sake ($3 for another 2x4 is well worth keeping all of your fingers intact). Keep each work piece attached to a larger chunk of wood that you can use to safely feed the rest of it into the band saw. Then when you have all the detail work completed, finish up by making one last cut to sever the finished piece from the larger chunk of wood. Don't. Use a coping saw with a very low profile or spiral blade. Woodworking small enough pieces to worry about your fingers means it'd be just as easy with a hand saw. Doresoom's edit about routing is most likely how they are factory produced. For cutting meeples, I would not use a band saw. I would use a scroll saw. Unless you have an insanely narrow bandsaw blade you won't be able to navigate the turns. An option is to use a drill press to bore out the armpit and crotch area of the meeples. You could probably use the bandsaw to remove the rest of the waste. If you insist on using the bandsaw, you must be sure there is no way a meeple (merpon?) can get between the blade and the hole in the table where the blade passes. If the area is large, clamp down a temporary zero-clearence table. To make one, get a square piece of plywood that's about the size of the bandsaw's table. Run it halfway through the saw. Stop the saw. Clamp the plywood in place. Now there is no room for your work to get wedged. I have been hit in my safety glasses my work falling into my bandsaw and inexplicably being shot at me. Just how large are these meeples? Do not use a band saw. It will not come out well. You could consider a scroll saw, but I would not use that either if it was me. If your fingers are getting too close to a tool, it's time for a jig. If I was going to try to do this with a bandsaw, I'd consider putting the piece I was working in a screw clamp. That would give you a larger object to manipulate, keeping your fingers away from the workpiece... and if you cut into the screw clamp that's not a disaster; they're wood so they won't hurt the blade, and they're fairly cheap (or cheap to cut new jaws for). 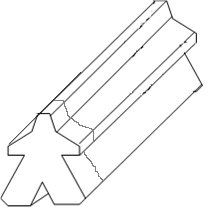 I agree that the manufacturers probably use router bits to cut these shapes. If I was going to go that route I'd design things so I was cutting not just an "extruded" man but a whole bunch of men hand-to-hand. Again, that gives you a larger object to manipulate and reduces risk. Then come back and rip that into sticks (the "extruded" shape Doresoom mentioned) and then crosscut at the bandsaw into individual men. Hand tools are definitely the way to go. 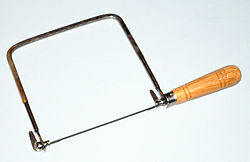 A Dremel type tool or hand router may be used for fine work. If you need to do larger quantities, find a laser or water jet cutter in your neighbourhood. I would really question if a band-saw (a tool that —at varying scales— meat processors use to slice whole cows in half and lumber mills use to process whole trees) is really suitable for such a small and delicate job. I'm not going as far as saying you shouldn't use a power-tool but there is another option that's a good compromise between the overkill of a powerful band saw and the slowness of the hand tools that others have suggested. A band saw is going to be fast but come on... Even after safety, consider how many separate cuts you're going to have to make on these little guys. Personally I'd opt for using a scroll saw with an omnidirectional spiral blade. If you're not familiar with them, they're essentially a blade that buzzes up and down in a fixed position and you move the wood around them. That does mean the output will be less accurate than some other tooling but that's not always a bad thing, especially when you're dealing with little characters like this. You can injure yourself on them but if you use the guard you're reasonably looking at losing a bit of fingernail instead of slipping and losing a hand. The machines are very cheap but you'll probably get through a few blades. I would protect my fingers by keeping them away from the blade. when I use my chop saw, I hold the piece I'm cutting by keeping it long and only cutting off the far end. It might call for sacrificing a little material since the last 4–5 inches is too short to safely cut that way. For example, to cut squares for a checkerboard or chessboard, let's say I want to cut 32 one inch squares from a 2 inch wide board. I would cut down the middle of it to make a pair of one inch wide boards, then keep cutting off the ends of those until I have 32 squares. All the answers have merit, but here is how I would do it. First, simplify the design so there are no curves and not too many faces. Take a piece of wood, say 2x2 or some other suitable size, that is at least 8" longer than ((thickness of piece + saw kerf) x number of pieces of that design). Use a router for shaping the block. Make sure that one side, probably the feet, is on an edge of the block. Since you simplified the design you can probably do the whole thing with one bit. Finally, use a table saw with mitre guide or cutoff saw to separate the pieces. The 8" handle will keep you safe here, too. Not the answer you're looking for? 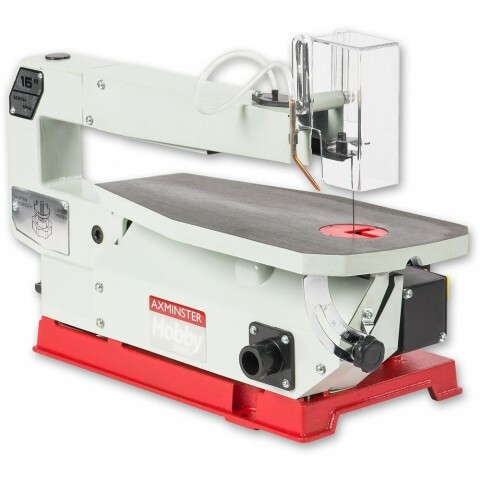 Browse other questions tagged woodworking safety bandsaw or ask your own question. Should my first power saw be a circular or jig saw? 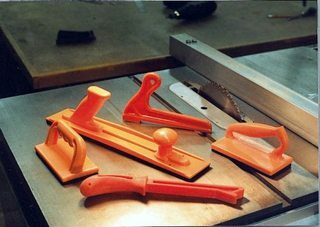 What types of tools are required for making wood toys and models? Would running a band saw or cnc machine in my basement be safe? Are there any major differences between a smaller table band saw and a larger stand up band saw? Cutting a Custom Threshold: Best Tool for the Job? As a beginner woodworker, should I buy a table saw or a band saw? Cutting thick wood veneer on band saw?